Stamp Presents and Vertical Merry Christmas on white or cream card stock, using VersaMark ink. 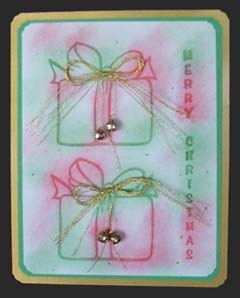 Using chalk applicator, rub red and green chalks across card. Tie a bow with gold fibers and add bells. Cut corners with decorative punch. Layer onto green and gold card stock.